A new take on our quilted jacket—a simply gorgeous spring coat in pastel matelasse. 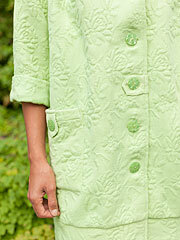 We've put the lush thick cotton matelasse fabric into our Peggy Jacket—a fabric usually found in quilts and coverlets. Adorned with a raised floral pattern, carved buttons, and tabs on the patch pockets with a decorative tab on the button closure.